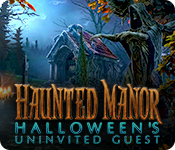 Haunted Manor: Halloween's Uninvited Guest is rated 3.6 out of 5 by 8. Rated 5 out of 5 by sgrwlf27 from What an amazing game I can't believe the level of fun and intrigue this game exhibited. Not only were the HOS different and challenging, but the puzzles....oh the puzzles. Never before seen types and so challenging. I bought the SE because I had a free game I needed to find an SE for. So glad I did. This was like a mystery and it didn't turn out the way I expected. Kudos to the developer and I will be watching for more of this type. Rated 5 out of 5 by HeavenBound7729 from A Little Scary, Lots Of Fun! This is a good game to bring out for future Halloweens, it is not intense like another recent holiday game. It provides some scary fun for a more laid back playtime. This one is more suitable for younger players and family participation. 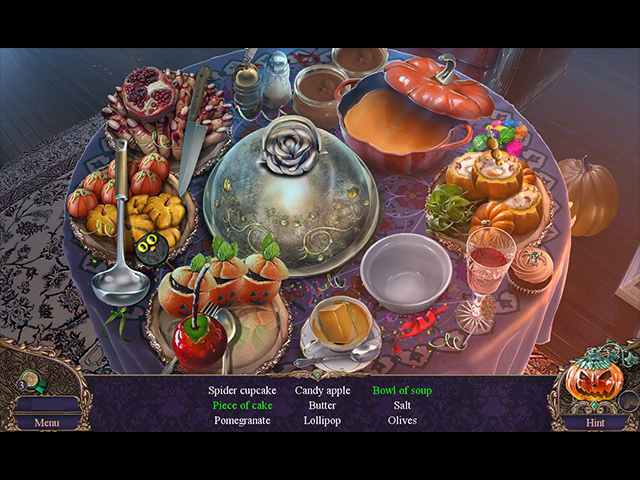 It is about a Halloween party prepared by twin sisters, Regina and Marianne. They did a great job decorating the big house inside and out with lots of everything to put you in the mood for the festivities. The party is going nicely until some strange things start happening and dead guests are discovered here and there. What in the world is going on?? We do find out that we have an uninvited guest amongst us. Maybe HE'S the party spoiler! A handsome/scary looking guy who just doesn't have good social manners. Of course he blends in very easily with the others, since it is a costume party. The graphics are very colorful and clear, the scenes are all nicely detailed. I had fun picking out my own beautiful costume from a nice selection. The HOPs and games were very enjoyable and some were unique to me. I thought the characters were done quite well. I don't understand why nobody's lips moved while speaking, except for one character. Thought that was rather odd! There were fun collectibles (I liked the witch), along with the usual fare. For me this was a fun Halloween game, not very difficult really, with a mystery attached and just enough scary moments. I did buy the CE because I was in that Holiday frame of mind and I do like the bonus chapter that is included. But surely the SE is just as enjoyable, unless you just can't resist the CE after-game extras. And holiday games are fun any time of the year, in my opinion. Yikes! Christmas games are right around the corner, too. Big Fish always keeps us happy. I am off to pick up some long awaited games in today's sale with a good, fresh cup of coffee. Rated 4 out of 5 by jdylea from Glad I didn't listen to the bad reviews! I read the bad reviews and choose not to play this. I knew I had a coupon that was about to expire and thought , what the heck give it a go and am glad I did. That's the thing about going by just the reviews and not trying it out for yourself. I don't go into depth on reviews, I just let you know whether I found it entertaining or not and I found myself saying out loud, whats not to like about this. I am enjoying it and I think if your on the fence, try it for yourself! I am totally entertained. Rated 4 out of 5 by deddu from WHO IS THE UNINVTED GUEST Good solid game that moves along with elements of suspense. I liked the novel mini-puzzles, the maze and picking the locks. The hidden objects are unique. I really liked the stained glass one. Rated 4 out of 5 by bluesycat from My Kind of Game - Story Based Based on the completed game. I loved this game. It is very heavily story based, even if the story is predictable. There is a lot of talking between the characters and it is the talk, rather than the game play that moves the game along for the most part. There are various types of HOs, although several of the types are repeated. There are standard ones, silhouette and few change the scene to find all the items, or move parts of the page around to find the items. Fun. 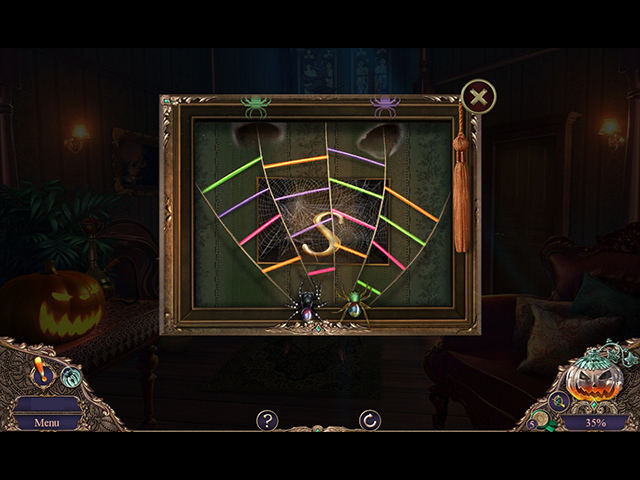 The puzzles were generally easy, although there were a couple of slider types ones I could not solve. I liked the characters, found their relationships interesting, if predictable. The only downside of this game (Standard Edition) is that it is TOO SHORT! I completed the game in around 4 hours, which is not enough entertainment for my purchase. Rated 1 out of 5 by roaming from Based on playing the entire demo Two missing persons, one dead body. They should've called the police. Then we might've had a real game instead of doing stuff like finding a gauge we need in order to turn off steaming hot water from the machine room, putting pumpkin lids back on pumpkins to get a key, matching up cupcakes to make them disappear, and the ever popular sword and whetstone bit. Like in how many games have we done Exactly The Same Things? I'm surprised there wasn't a broken zipper on the medical bag, because doesn't every game have a medical bag or a purse that you can't get into without finding just the right thing needed to get into it? I actually thought the best part was at the beginning when deciding what costume to wear to the party. It reminded me of playing paper dolls when I was a kid. But hey, try it. You might like it.